Low Carb Peanut Butter Oatmeal is the perfect healthy breakfast that tastes like dessert! It’s gluten free, grain free, vegan and dairy free. Oatmeal is one of our favorite things to have for breakfast. 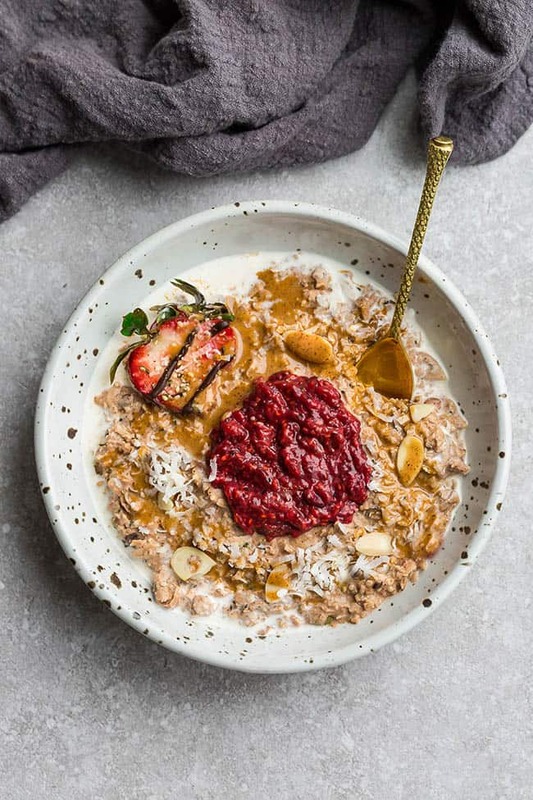 We’ve got a ton of non keto oatmeal and keto oatmeal recipes on here and this Low Carb Peanut Butter Oatmeal is perfect for the PB & J fans that are following a keto diet. It comes together in less than 5 minutes and is made without any “real” oats. Instead, this peanut butter “Noatmeal” is made with low carb, paleo & keto-friendly ingredients. Start by adding coconut, hemp seeds, water & milk in a medium saucepan.Bring to boil then simmer for 2 minutes until thickened. Stir in peanut butter (or pure peanut powder), vanilla & cinnamon until combined. 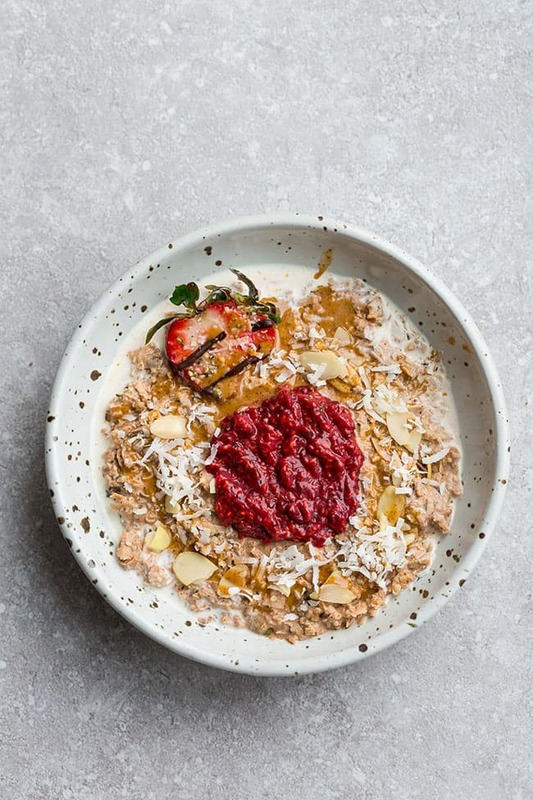 Top with shredded coconut, slivered almonds, strawberry chia jam and you’ve got a delicious bowl of Peanut Butter and Jelly Oatmeal. 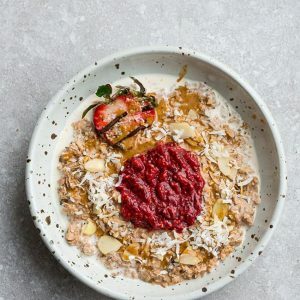 CAN YOU HAVE OATMEAL ON A KETO DIET? 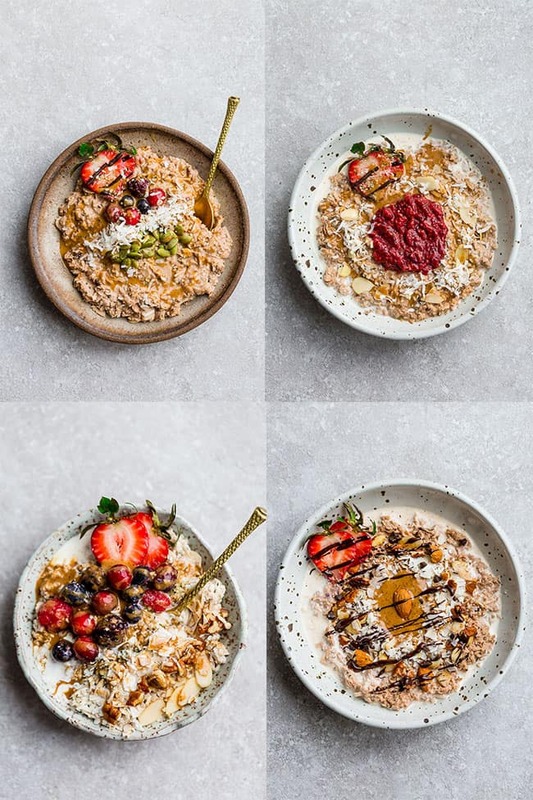 Since oatmeal is typically made with grains like rolled or steel cut oats that are higher in carbs, it does not typically fit into a low carb, paleo or keto diet. This low carb peanut butter oatmeal recipe is made without oats or sugar, so you can certainly enjoy a warm and nutritious bowl of noatmeal for breakfast when you’re craving it. Bonus points for being naturally gluten free, grain free and dairy free. I love that I can now make a quick and hearty bowl of paleo oatmeal when that craving hits. This low carb oatmeal is sure to hit that spot on a cold winter’s morning. CAN YOU MAKE PEANUT BUTTER OATMEAL AHEAD OF TIME? Yes, absolutely. This low carb peanut butter oatmeal reheats beautifully so it works perfect for meal prep. Simply store in an air-tight container in your fridge for up to 4 days. You can reheat it in a microwave-safe bowl for 1 minute on high or on the stove-top on medium heat. Low Carb Peanut Butter Oatmeal is the perfect healthy breakfast that tastes like dessert! It's gluten free, grain free, vegan and dairy free. Add coconut, hemp seeds, coconut flour, water & milk in a medium saucepan. Bring to a boil then simmer for 2 minutes until thickened. Stir in peanut butter (or peanut powder), vanilla & cinnamon until combined. Serve with more milk and toppings of choice.